WinamPAQ is a free MP3 player for Pocket PC, that emulates the famous Winamp app for Windows. Winamp has always been one of my favorite music players for Windows, and I still maintain that it is better than the bloated monster that is iTunes. If you too are a fan of the player then you may wish to download WinamPAQ for your Pocket PC. The application lets you play MP3s and other audio tracks (but not videos) on your device. WinamPAQ's oh-so familiar interface consists of the player control window, EQ and playlist editor, all stacked on top of each other. If you want though you can choose to hide any (or all) if these windows to make space on your screen. One of the traditional complaints from anti-Winamp users is that the user interface is too small and fiddly, and this is only exacerbated in WinamPAQ by the size restrictions of the Pocket PC display. Touchscreen users can forget being able to quickly use the volume control, EQ sliders and many other functions simply because the buttons are too tiny. Luckily, there is a Scale feature in WinamPAQ that lets you zoom in by up to 200 percent, although if you do this you'll have to scroll around the interface rather than viewing it all at once. Another way around the problem could be to take advantage of the programmable hardware button support afford by WinamPAQ, which lets you assign common controls (Play, Pause, Back, Forward, Open, etc.) to individual keys on your PPC. Like its Windows-based relation, WinamPAQ manages to pack in lots of cool MP3 playing features inside. You can repeat tracks, shuffle them, organize them into playlists and manipulating playback sound all through the main interface. The Preferences menu lets you make further customizations to the player, though sadly this version of the program only comes with one skin. 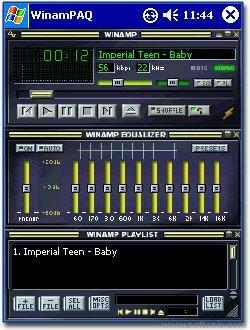 Die-hard Winamp fans will enjoy using WinamPAQ for sure, while others will probably get frustrated by the overly intricate interface.